Preview: FREE spring addition puzzles. Perfect for kindergarten or first grade. Makes an easy math center. Spring is right around the corner, right? Right? It is coming, right? It seems like we have had never ending snow since December and it is still on the ground and coming down in March. 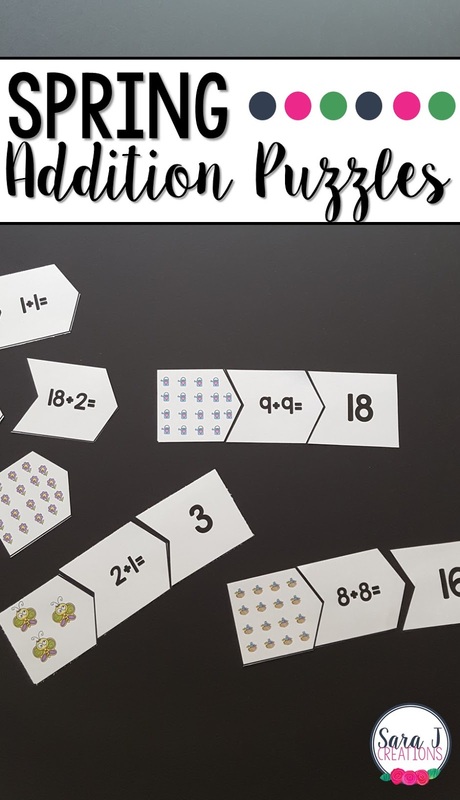 Hopefully, spring will be here soon, but to get us in the mood I've got some FREE spring addition puzzles that practice numbers 1-20. Check out what an easy math center this would be. Each puzzle has three parts - a picture, a number sentence and an answer. Just cut the rectangles out and then cut the rectangle apart into the three parts. Have students work on finding the addition sentence and solving. Then they will need to find the answer in number form and in picture form. There is a puzzle that has an answer for each number 1-20 in this set. This is easy to differentiate for your students. Give the smaller sums to students just starting out in the world of addition or struggling preschool or kindergarten students. Save the larger sums for children who have a basic understanding of addition. To grab your free set of Spring Addition Puzzles, just click the "click to download" button, enter your information and they will be emailed directly to you. Enjoy and think spring! !